Chicken marinated in lemon and herbs makes an ideal light midweek family meal. Easy to prepare, it is quick to cook and packed with flavour. Place the chicken breasts either between 2 layers of clingfilm or in a large, clean plastic food bag, seal then beat them with a rolling pin to flatten out to about a 1cm thickness. Place 2 tablespoons of the oil, the garlic, zest and juice of 2 of the lemons, the rosemary and paprika in a shallow dish. Add the chicken and turn to coat. Cover and place in the fridge and allow to marinate for 3-4 hours. Heat a large, heavy-based frying pan or griddle pan until very hot. Add the chicken with the marinade and cook for 6-7 minutes on each side until thoroughly cooked, the juices run clear and there is no pink meat. Remove from the pan and keep warm. Meanwhile, cook the couscous according to the pack instructions. Wipe out the frying pan with clean kitchen paper and heat the remaining tablespoon of oil. Quickly fry the pepper pieces until just starting to soften. Remove and keep warm. Slice the remaining lemon into 8 slices and add to the pan. Cook for 30 seconds on each side until the edges char slightly. 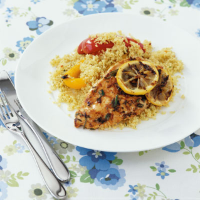 Serve the chicken with the peppers, lemon and couscous. Marinate the chicken in the fridge overnight to increase the flavour. If time is short, the chicken will still absorb some of the flavour if left for only 30 minutes.